Some groups specialize in topics such as health literacy, law, science, or finance. In addition, these groups may also provide related services, including consumer research, usability testing, web content strategy, or organizational change consulting. Consultants: Want your company listed here? Members in good standing can list their company for $100/year. If you need to join or renew, please complete that step first. 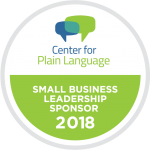 The Center for Plain Language presents the consultant list as a service to the community. These organizations are not endorsed by the Center for Plain Language. Each group pays $100/year for their listing. In addition, they agree to abide by the Center for Plain Language Code of Professional Ethics. You should verify the credentials of the consultant you choose just as you would with any new vendor.